Take on the role of a Renaissance mosaic tile master, crafting a stunning work of art. Compete against your rivals and emerge as the best! 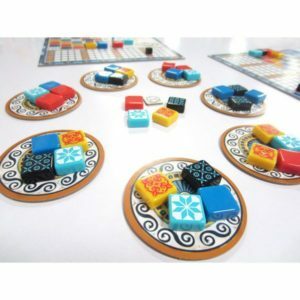 Concepts: Azul is a tile placement game based in which players compete to complete a pattern before anybody else, scoring points for doing so in an efficient manner. You will need to buy the right tiles to stand a chance of winning. Players gain points by completing horizontal or vertical lines on the pattern, whilst wasting tiles will cost you points. The player with the most points by the end wins. Writing: Azul’s rulebook is laid out in a clear and simple manner, in sections that are easy to find and understand. It is functional but lacking in unnecessary additional flourishes. Players should have no issue in understanding the game’s operation from the rules as written. It is extremely easy to pick up and play. 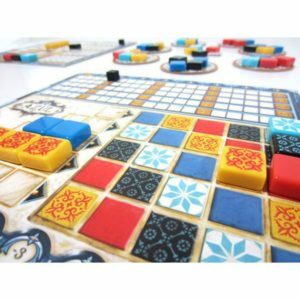 However like many abstract games, Azul’s focus is not on its theme and therefore fans of games with stronger themes may find that it lacks appeal. Mechanics: Each player has a board upon which tiles are placed. To one side is placed a number of circular ‘factory’ boards. At the beginning of each turn, players select tiles to add to their board from the a factory board – during this selection, only tiles of the same colour can be chosen from a factory, with the remaining being placed into a central pile between the factory boards. Whilst each factory board can hold only four tiles (and are refreshed at the end of each turn), the central pile can hold any number. Once the player has acquired their tiles, they are placed onto the board – each player’s boards includes a scoring area, a pattern (where the tiles eventually end up), a set of five horizontal pattern rows with spaces for the tiles to go (the top row has space for one, two for the second, all the way down to five), and a floor line (where you don’t want tiles to go). Once drawn from the factory, each player places their tiles into one of the pattern rows – any that you cannot fit go to the floor line where they start racking up penalties to the player’s score. Once a pattern row is full, the right-most tile on that row is placed on the pattern, in the same horizontal line as the pattern row and to its corresponding space for that tile’s colour. Other tiles in that row that remain are removed from the game. Tiles earn points with bonuses for completing full rows and columns, and the player with the most points is the winner. Design: Like the writing, this is functional. Tiles are nice, a fair size and sturdy and come with a bag that is nicely embroidered and stylish. The colour choices are easy to read and the patterns are strong, meaning that this game would work well with players who have issues with pattern recognition. One flaw that I did find is that the scoring area only lists numbers in increments of 5s and 10s, which may be problematic for some players. Playability: Azul is fantastically playable. Each phase of the game offers a variety of different strategies for the enterprising player. Choices that are made when selecting tiles from the factory can have a huge impact, and a cunning decision can gain them a strong advantage in later turns. Do you grab one tile in order to load it right onto your top row, or do you try to load the centre pile with enough of one colour in the hopes of snatching five of them later and place one on the bottom row? Every turn provides the players with a plethora of decisions to make. As each player is striving to achieve the same goal, gameplay very quickly becomes a rush to trying to figure out one another’s strategies. Conclusion: Overall we enjoyed Azul. Gameplay is a challenging experience due to the number of decisions that need to be made each turn, but it is easy enough to learn and quick to get into, allowing this game to work very much as a family game. Whilst not excessively competitive, it is a very enjoyable experience and it is clear to see why it has become such an award-winner. 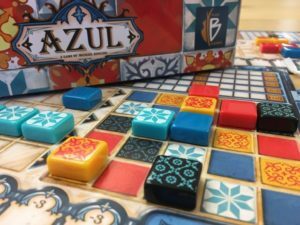 FINAL THOUGHTS: Fun and involving, perfectly suited to lively gaming evenings or lazy Sunday afternoons, Azul is a game that deserves its place in any gaming collection.